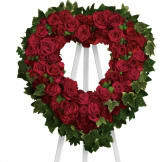 This beautiful, open heart is a wonderful way to share your thoughts of love and sympathy. 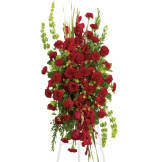 • Red roses, spray roses, carnations and miniature carnations are arranged with fern and ivy in the shape of a heart. 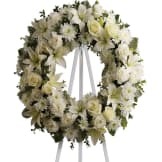 • Arrangement measures approximately 23" W X 24" H.
Flowers will be received by a Olthof Funeral Home's staff. it was beautiful but for the price it should be bigger. 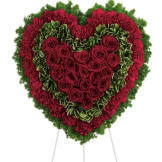 All of our flowers are designed and delivered by hand from a local florist in in Elmira.